The Aquadyne 1.1 B Bead Filter is perfectly suited for koi ponds up to 3000 gallons. The Aquadyne 1.1B Bead Filter will support up to 30 kg of koi. The Aquadyne 1.1 Bead filters have been engineered specifically for koi ponds and water gardens. The Aquadyne is available in four sizes, the secret to the Aquadyne bead filters, is that they feature a central diffuser column that reduces internal friction loss. The Aquadyne 1.1 Bead filter design has no internal elbows, and allows maximum water flow under the most abusive feeding practices. The Aquadyne 1.1 Bead filter supports colossal amounts of fish AND delivers GIN CLEAR water, without flow restrictions. We cannot foresee a more perfect bead filter being introduced than the Aquadyne Bead filter . The best part of the Aquadyne 1.1 Bead filter is it's unique plumbing which allows water to bypass the filter completely, for medication purposes. The rinse cycle in the Aquadyne is an absolute must, as there is absolutely no "brown dirt cloud" after a backwash. The Aquadyne 8.8 C Filter is Perfectly suited for koi ponds up to 24000 gallons. The Aquadyne 8.8 C Bead Filter will support up to 218 kg of koi. The Aquadyne 8.8 bead filters have been engineered specifically for koi ponds and water gardens. Available in four sizes, they feature a central diffuser column that reduces internal friction loss. The Aquadyne 8.8 Bead filter design has no internal elbows, and allows maximum water flow under the most abusive feeding practices. The Aquadyne 8.8 Bead filter supports colossal amounts of fish AND delivers GIN CLEAR water, without flow restrictions. We cannot foresee a more perfect bead filter being introduced. The best part of the Aquadyne Bead filter is it's unique plumbing which allows water to bypass the filter completely, for medication purposes. The rinse cycle is an absolute must, as there is absolutely no "brown dirt cloud" after a backwash. 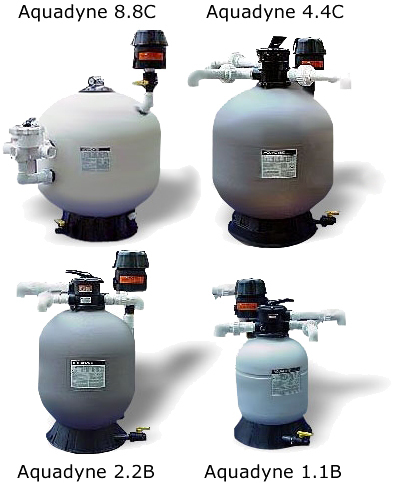 During a normal non-air assisted backwash cycle, the Aquadyne 8.8C Bead Filter would typically require between 200-300 gallons of water to effectively clean the filter of waste. With the Dyna-Max system you can backwash the same filter with as little as 60 gallons of water. This is most desirable for those wishing to install a larger filter on a pond of a lesser volume of water than the filter is rated for, because very little make-up water has to be added to the pond after a backwash cycle and a much larger fish load can be maintained in a smaller environment.